The Honor Farm - BUY THIS DVD! When prom turns out to be an epic failure, Lucy is forced to rethink her plans. In a rash move, she opts for an adventure with some misfits from school to a psychedelic party in the woods. Looking for a thrill, the group wanders deeper into the forest, to a haunted, abandoned prison work farm. Lucy s secret wish and a summoning of the dead sends the group on a mind-bending trip where Lucy must face her deepest fears and desires. Sometimes, especially for a teenager, life can dish up a night that changes the way you look at the world and yourself. 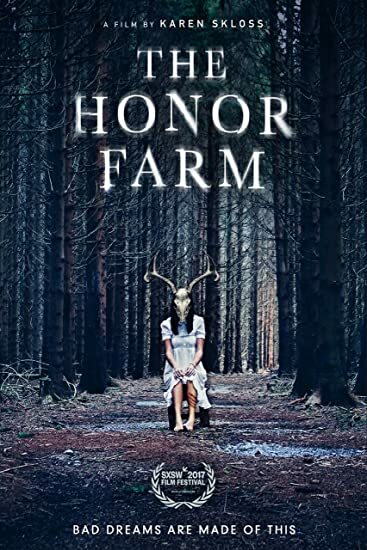 THE HONOR FARM takes the most beloved youth genres - horror, coming of age, 80 s teen comedies - and blends them all together in original and clever ways to tell a story of one high school girl s surreal passage to adulthood. Picking up where Pretty in Pink left off, while taking notes from Heathers and River s Edge, THE HONOR FARM is an allegorical ride about a girl figuring out that life s rulebook is a bit more complex than she thought. THEN SEND IN YOUR NAME, ADDRESS & 5 COMMENTS TO contests@efilmcritic.com. Put "I HAVE NO HONOR ANYMORE" in the subject line and cross your fingers. We will draw names and one of the prizes could be yours. Only 1 entry per household.